In October 2015, SSAT, in partnership with Dulux (part of the AkzoNobel Group) launched a new and exciting action research project in schools, that empowers learners to take an active role in the design and application of a ‘smarter space’ for teaching and learning. Nine schools from across the country were selected, from a strong set of applications, to be part of this project. Between November 2015 and 2016, each school’s students worked with a Dulux designer to go through the design process to create a ‘smarter space’ for their school. Once completed, the schools used this ‘smarter space’ creatively across the school to investigate the implications for teacher practice and the effect on learner engagement and activity. 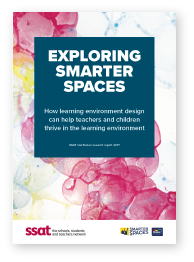 Through the process of action research, the smarter spaces project investigated the impact of this new space on teacher pedagogy and young people’s learning and engagement. Each school reported on how their ‘smarter spaces’ impacted on their teaching and learning. Find out more about these schools’ projects.